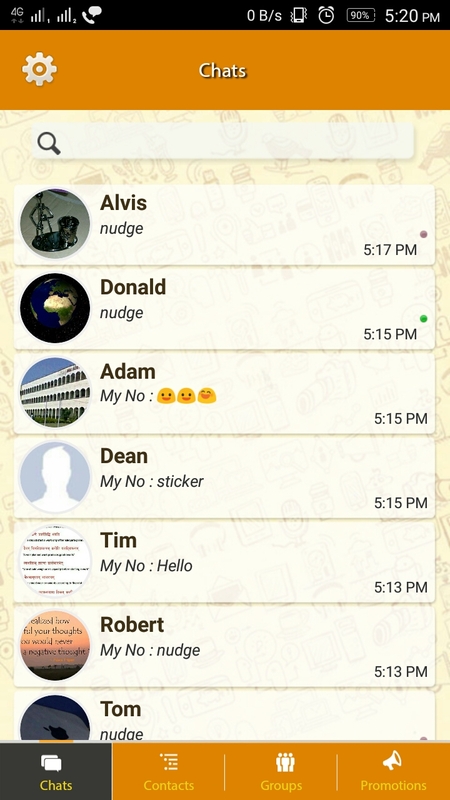 BirdsBeep Messenger is a cross-platform chat application which allows its users to exchange text, image, audio, video messages for free. Along with this users can also schedule messages, send gifts, share location, make audio & video calls, share you tube videos and much more. 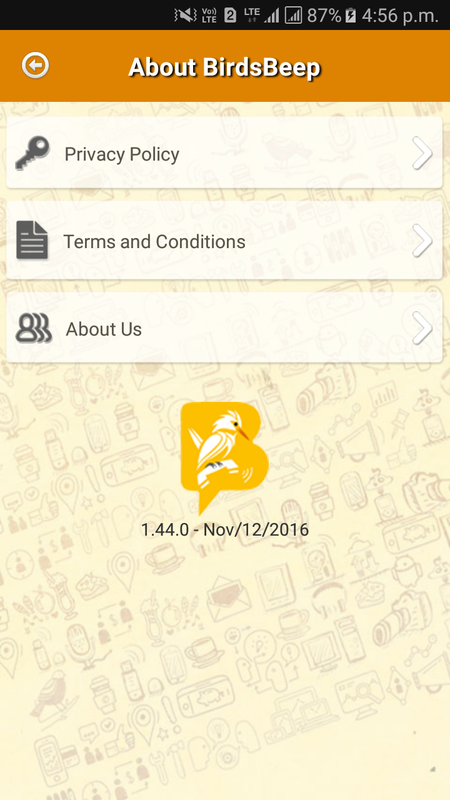 You can download the BirdsBeep application from this very website which happens to be the official website of BirdsBeep. You can go to the download section of the website, then to its subsection IOS and there by clicking on the provided button you will be redirected to the app store section from where you can download the application. Apart from this, you can always directly go to the app store on your phone and can have the BirdsBeep application by downloading and installing it in your phone and eventually availing the application and its seamless services. b. Enter your mobile number and you will get the six-digit code on your phone for verification. c. After verifying your mobile number through this authentic verification process, you will now be able to enter in to your profile and use the application and its features. 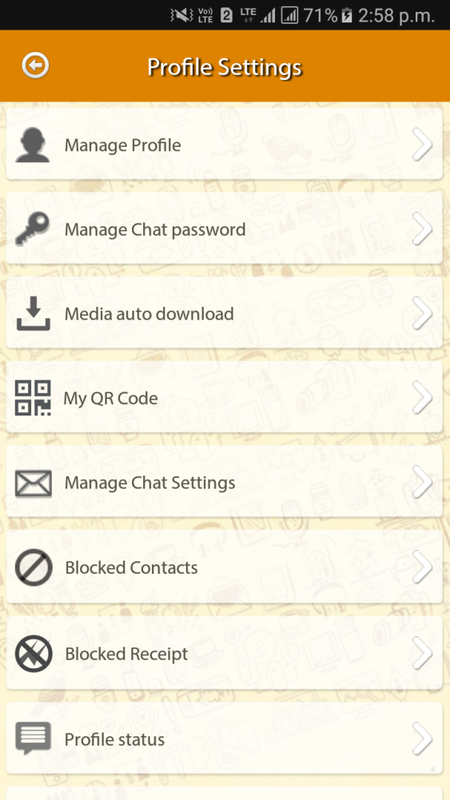 This is the section that enables you to not only manage your profile and other chat settings but also brings to you so many features options like managing your photo album , unique feature like parent – junior , scheduling of messages , rating the application and many more. a. 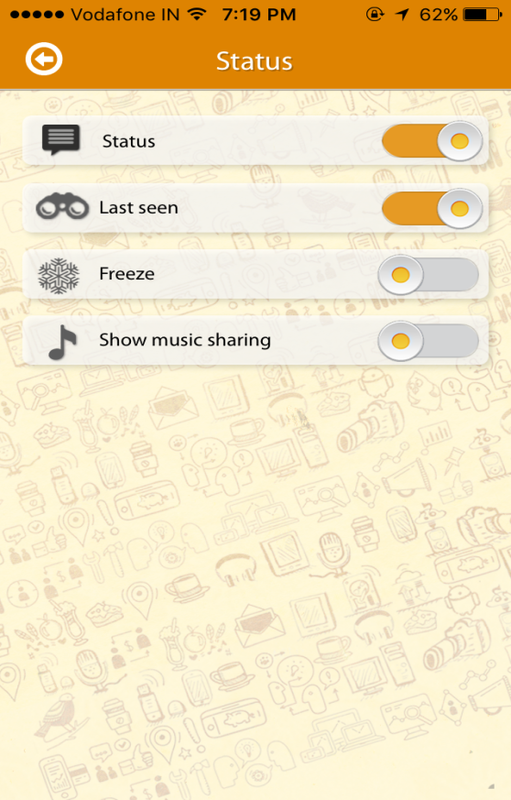 Status: - As you will go down to the settings panel the very first thing you will get is this 'Status' option by using which you can manage your profile status , last seen & music listening status to be visible to your other BirdsBeep contacts & friends . This section also includes a very unique feature that BirdsBeep brings to you which is freezing your current online status (not your profile status) .If you make this freeze option ON then your friends or contacts on the application will not be able to see you as online in the application and only your last seen status (last time you were seen in the application) will get displayed to them (that last seen time will be that time at which you switched on this freeze status ON). b. Settings: - Next option you will find under the settings panel is another settings option that includes all the profile related settings such as managing your profile, managing your chat passwords, managing the auto-downloading of media files, handling of the notifications on your BirdsBeep account, managing the chat settings and many more. 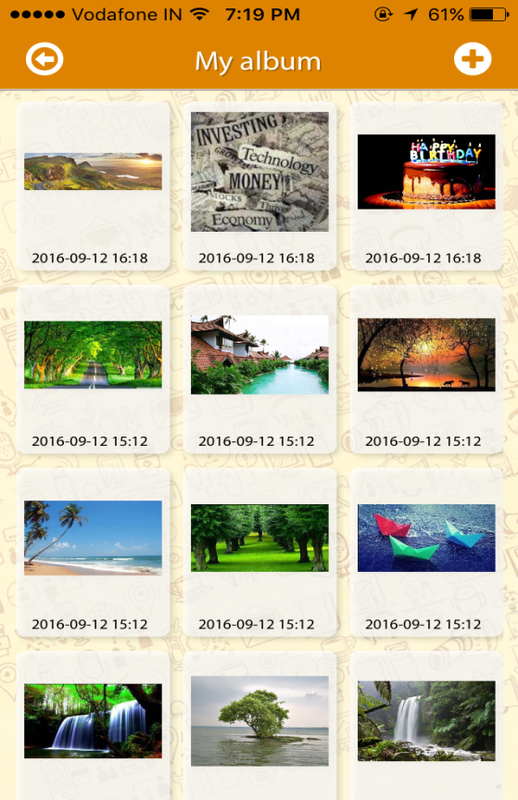 c. My Album: - Next is the “My Album” option which enables you to manage your photo album by adding multiple pictures in your album that can be further liked and commented by your friends who visits your album. You can always remove your existing pictures and add new ones in to your album. d. Juniors:- This a very unique feature that BirdsBeep brings to you in order to make a complete check and have a control over your child’s / junior’s activities throughout the application who has his/her account in BirdsBeep. You just have to go to this section, enter the phone number of the user and send a parental request to that BirdsBeep user. As soon as he accepts your request, he becomes your junior and you will be able to have a complete control on his activities like users he wants to interact to and the groups he gets joined in or creates by himself. 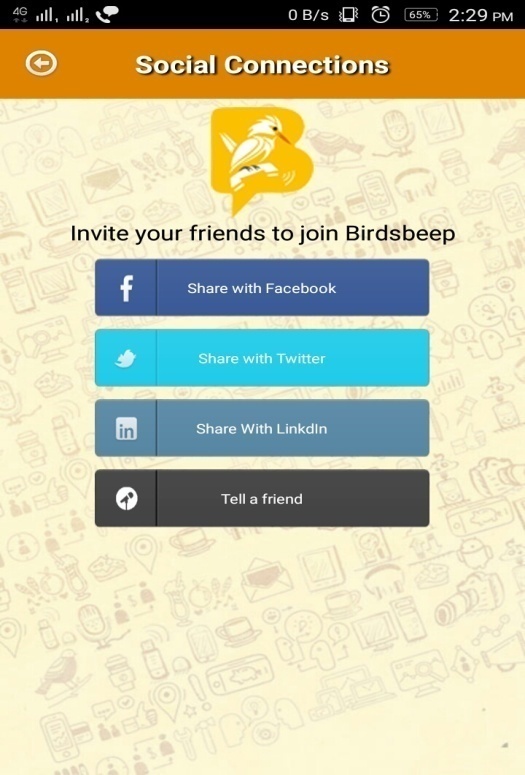 e. Social Connections: - This is the option by using which you can invite your friends to join BirdsBeep by sending them invitation via social networking sites face book, twitter, LinkedIn. Apart from this you can also invite them via email and sms. f. Auto backup Settings: - By enabling this option you can allow your BirdsBeep contacts to import your contacts, profile and album to their phone on which they are logged in. 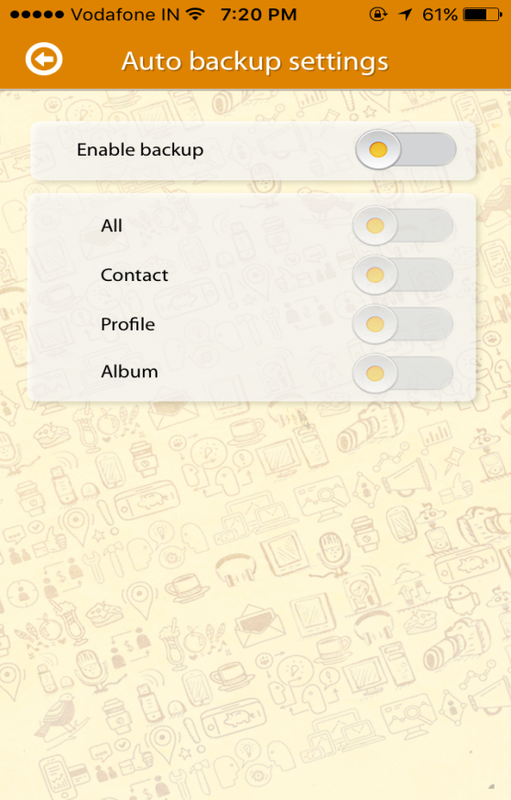 The basic use is to enable this backup option on your phone so that you can transfer your contacts, album pictures etc to your other phone on which you are logged with another number of yours on BirdsBeep. g. Schedule Message: - Through this section you can schedule a message for any particular future date & time to your friends & contacts. This is a very handy option in case if you want to send a common message like an announcement or any invitation to your friends then you can use this by setting the date and time , selecting the users from your friend list and scheduling them the message. 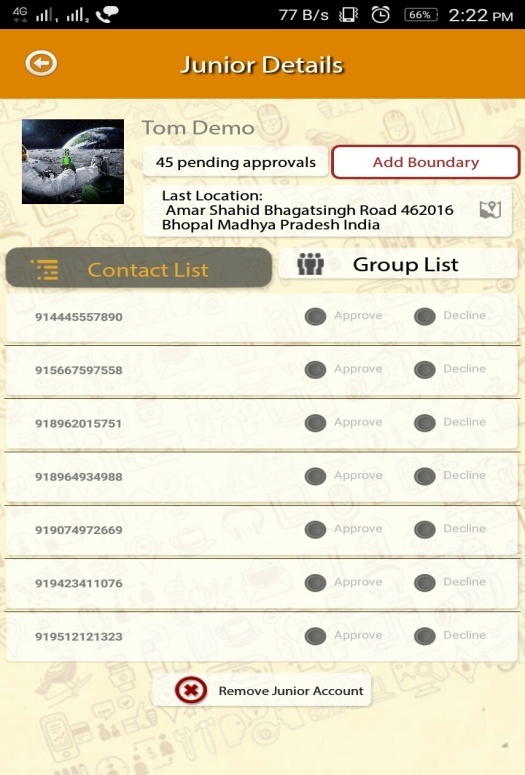 h. Import Contacts: - Having this import contacts option in the application came from an idea that what if a person want to transfer all his BirdsBeep contacts, album pictures and his profile on to his other phone that he acquires. 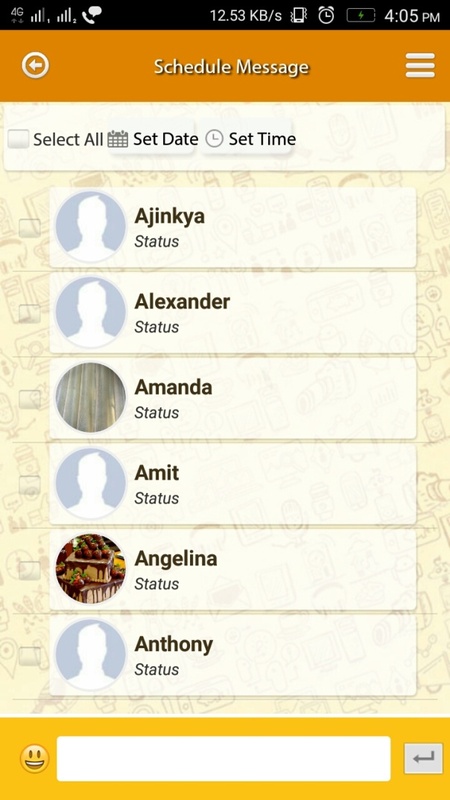 Through this option you can import the contacts, album pictures, profile of your other phone on which you are logged with another number of yours on BirdsBeep. We have a very secure way of doing this process in which when you enter the phone number from where you want to import the details then that number gets a verification code and until that code is entered and the number is verified you will not be able to import the details from that number. i. Rate us: – From this section you can rate the BirdsBeep application. j. About BirdsBeep: - This section gives you the details about the privacy policies, terms & conditions other needful details about BirdsBeep and its features. 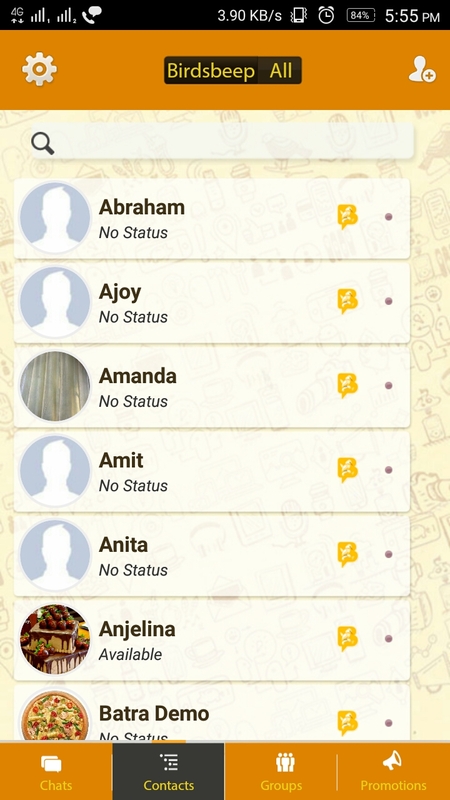 This is the section where all the recent chats done by you get listed whether it is a single chat or a group chats. You also get the option of searching for a particular chat from this section. 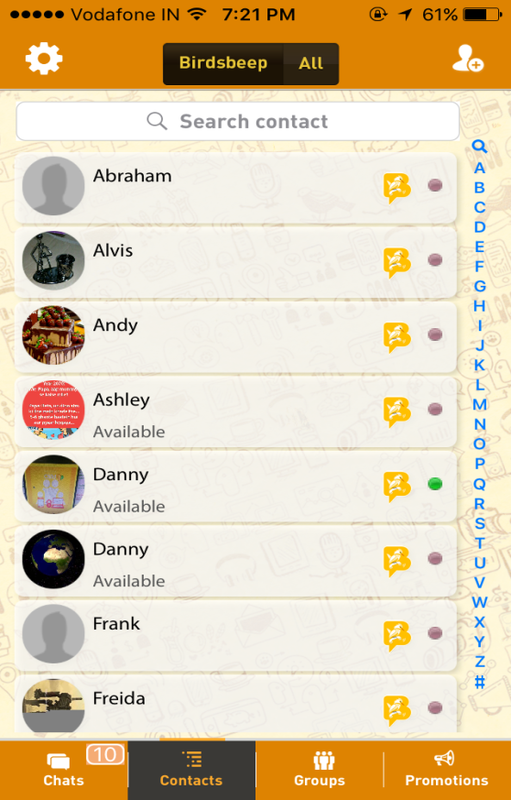 As the name suggests, in this section you will get all of your BirdsBeep contacts listed. 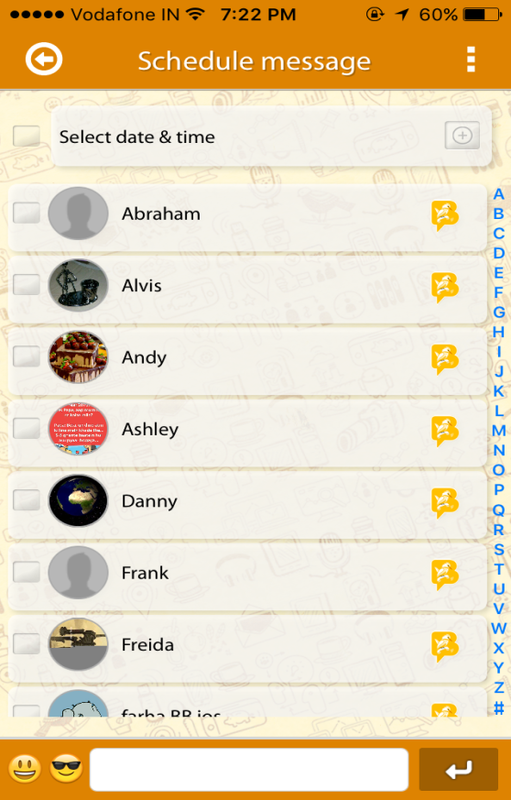 From this very section you can also add new contacts to your contact list. This section contains all the groups which you have created or in which you have been added by other users. You also have the option to add a new group from this section and you can also search for the public groups and become a member of them. This is the section which is used for the promotional purposes where the advertisers will make their advertisements displayed be it in the form of images or videos. BirdsBeep Messenger is a cross-platform chat application which allows its users to exchange text, image, audio, video messages for free. Along with this users can also schedule messages, send gifts, share location, make audio & video calls, share YouTube videos and much more. You can download the BirdsBeep application from this very website which happens to be the official website of BirdsBeep. You can go to the download section of the website, then to its subsection Android and there by clicking on the provided button you will be redirected to the Google Play Store section from where you can download the application. Apart from this, you can always directly go to the Google Play Store on your phone and can have the BirdsBeep application by downloading and installing it in your phone and eventually availing the application and its seamless services. c. After verifying your mobile number through this authentic verification process, you will now be able to enter your profile and use the application and its features. 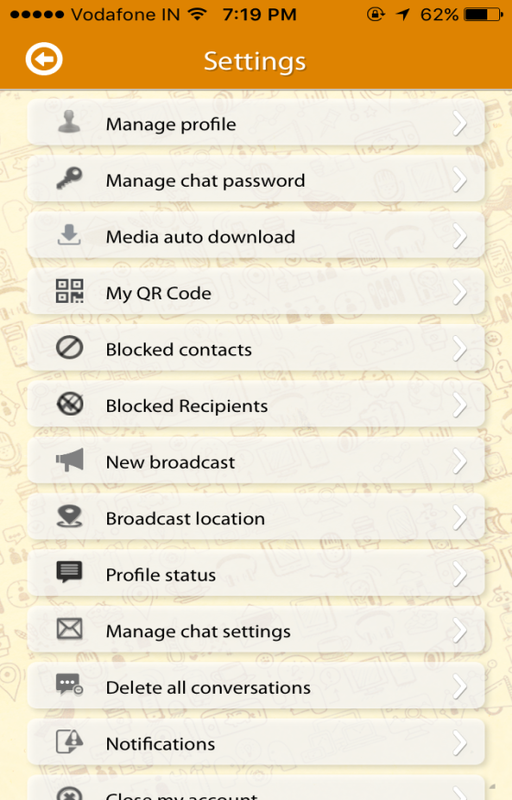 This is the section that enables you to not only manage your profile and other chat settings but also brings to you so many features options like managing your photo album, unique feature like parent – junior, scheduling of messages, rating the application and many more. a. 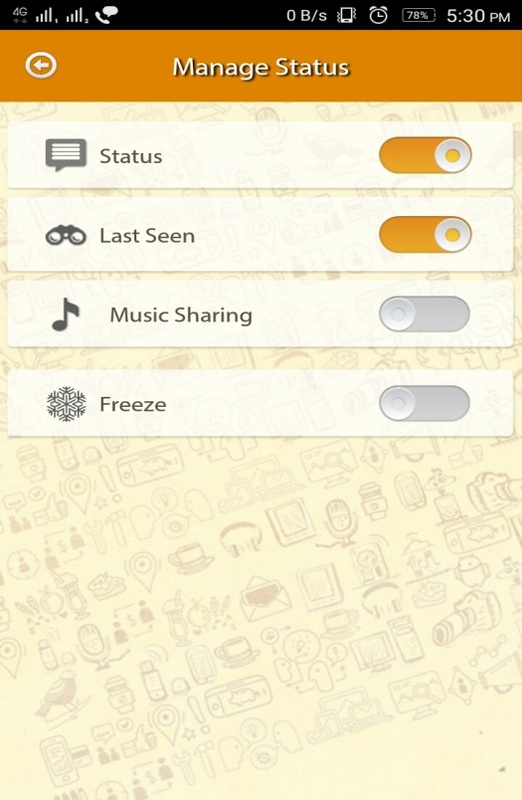 Status:- As you will go down to the settings panel the very first thing you will get is the 'Status' option by which you can manage your profile status, last seen & music listening status to be visible to your other BirdsBeep contacts & friends. This section also includes a very unique feature that BirdsBeep brings to you which is freezing your current online status (not your profile status). If you make this freeze option ON then your friends or contacts in the application will not be able to see you as online in the application and only your last seen status (last time you were seen in the application) will get displayed to them (that last seen time will be that time at which you switched on this freeze status ON). 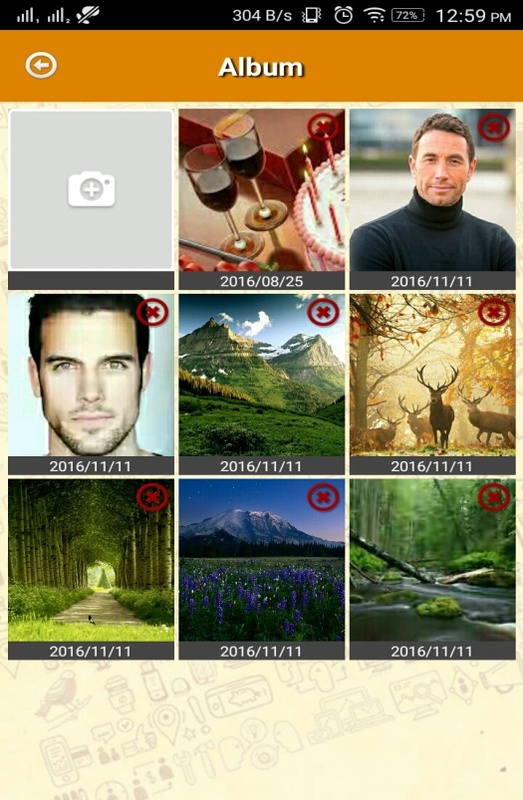 c. My Album: - Next is the “My Album” option which enables you to manage your photo album by adding multiple pictures to your album that can be further liked and commented by your friends who visit your album. You can always remove your existing pictures and add new ones in to your album. d. Juniors:- This is a very unique feature that BirdsBeep brings to you in order to make a complete check and have a control over your child’s / junior’s activities throughout the application who has his/her account in BirdsBeep. You just have to go to this section, enter the phone number of the user and send a parental request to that BirdsBeep user. As soon as he accepts your request, he becomes your junior and you will be able to have complete control on his activities like users he wants to interact with and the groups he joins or creates by himself. 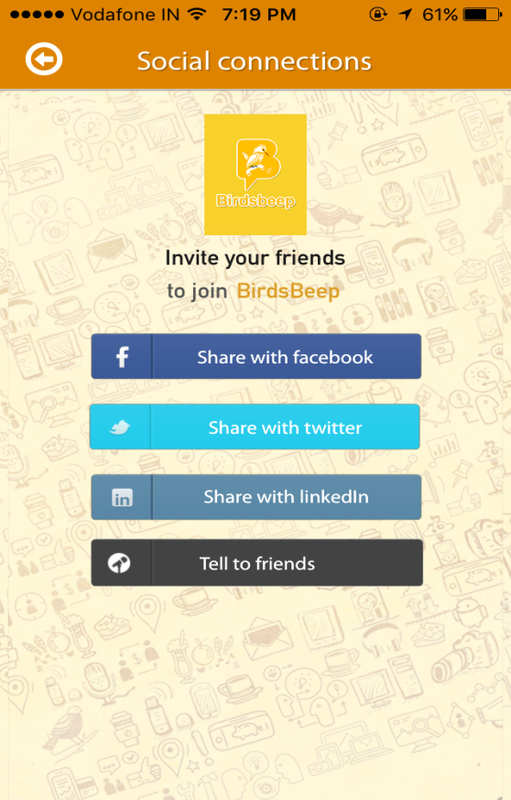 e. Social Connections: - This is the option in which you can invite your friends to join BirdsBeep by sending them invitations via social networking sites like Facebook, Twitter, LinkedIn. Apart from this you can also invite them via email and sms. f. Auto backup Settings: - By enabling this option you allow your BirdsBeep contacts to import your contacts, profile and album to their phone on which they are logged in. 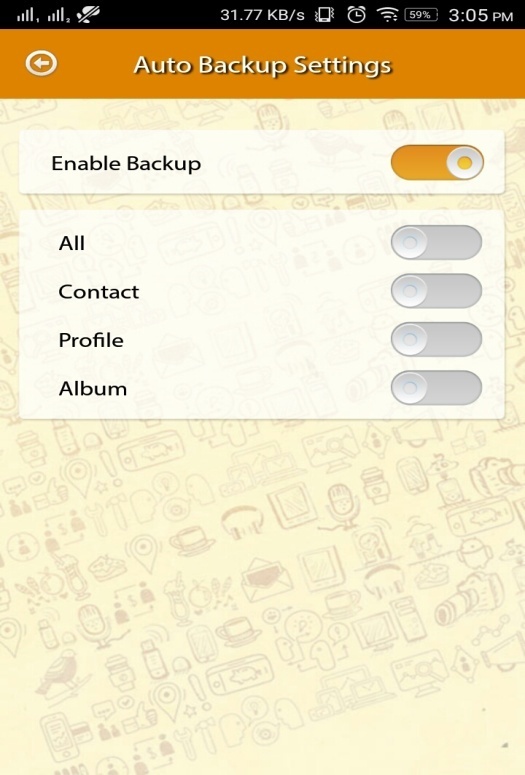 The basic use is to enable this backup option on your phone so that you can transfer your contacts, album pictures etc. to your other phone on which you are logged with another number of yours on BirdsBeep. g. Schedule Message: - Through this section you can schedule a message for any particular future date and time to your friends and contacts. This is a very handy option in case you want to send a common message like an announcement or an invitation to your friends then you can use this by setting the date and time, selecting the users from your friend list and scheduling them the message. 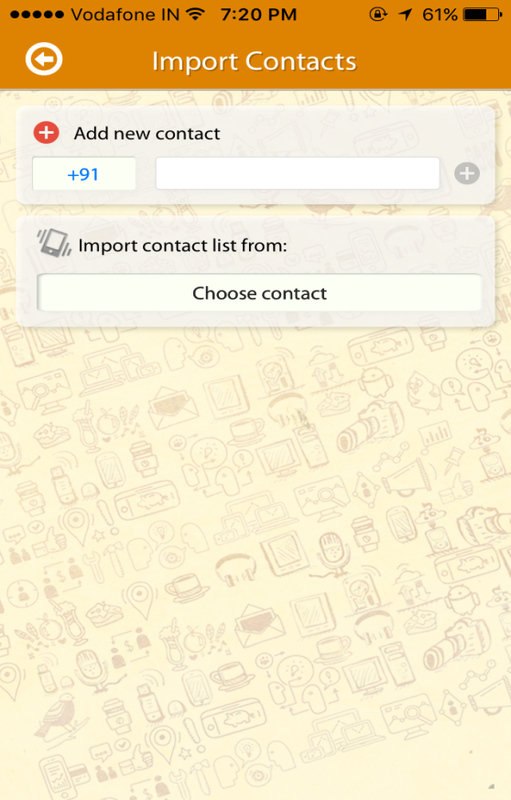 h. Import Contacts: - Having this import contacts option in the application came from an idea that what if a person wants to transfer all his BirdsBeep contacts, album pictures and his profile on to his other phone that he acquires. 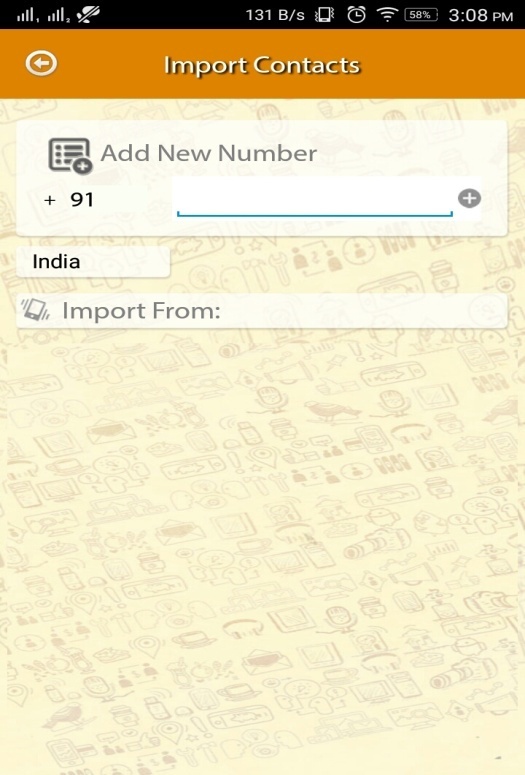 Through this option you can import contacts, album pictures, profile from your other phone on which you are logged in with another number of yours on BirdsBeep. We have a very secure way of doing this process in which when you enter the phone number from where you want to import the details then that number gets a verification code and until that code is entered and the number is verified, you will not be able to import the details from that number. i. Rate us: - From this section you can rate the BirdsBeep application. j. About BirdsBeep: - This section gives you details about privacy policies, terms & conditions and other useful details about BirdsBeep and its features. 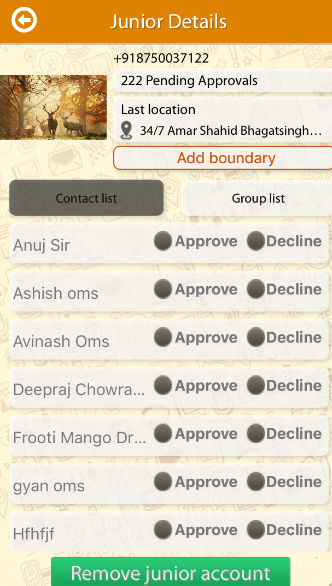 This is the section where all the recent chats done by you get listed whether it is a single chat or a group chat. You also get the option of searching for a particular chat from this section. This section contains all the groups which you have created or in which you have been added by other users. 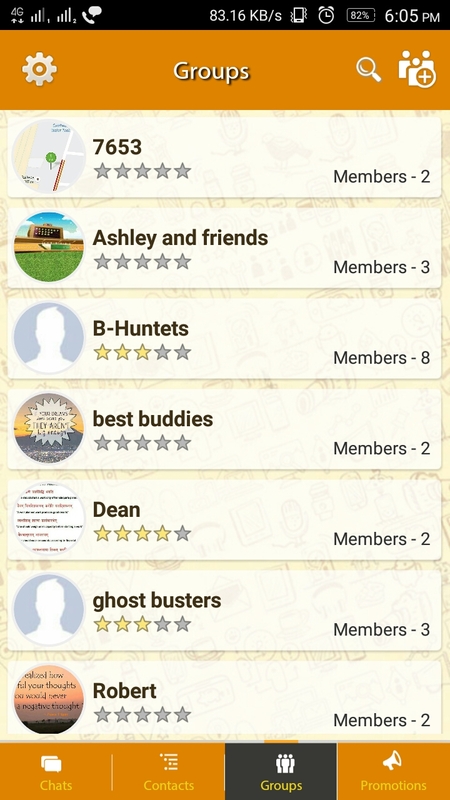 You also have the option to add a new group from this section and you can also search for public groups and become a member of them. This is the section which is used for promotional purposes where the advertisers will make their advertisements displayed be it in the form of images or videos.